EasyPGX ready EGFR plus (cod. RT030) is the only complete kit for in vitro diagnostic use, which allows the dection of T790M and C797S mutations (two variations) in the oncogene EGFR via Real Time PCR. Somatic mutation T790M represents both, acquire resistance to EGFR tyrosine-kinase inhibitors (first and second generation) and also the target of EGFR TKI (third generation). On the other side, multiple studies demonstrate that C797S mutation is one of the key aspects responsible for the acquired resistance to third generation of EGFR TKI. Approximately 15% of Caucasian and 30-40% of Asiatic patients with Non Smal Cell Lung Cancer (NSCLC) carry somatic mutations in the Epidermal Growth Factor Receptor (EGFR) gene such as E746_A750del and L858R. These patients respond to first- and second-generation EGFR tyrosine kinase inhibitors (TKI) 1-3. Nevertheless up to 50% of treated patients develop resistance mechanisms due to T790M mutation 4-8. Recently, a third-generation EGFR TKI was approved as a treatment for patients with NSCLC harboring T790M mutation or as first-line treatment for patients with activating EGFR mutations 9,10,13. EGFR C797S mutation is one of the resistance mechanisms to EGFR third-generation TKI and it could be present with theT790M mutation 11-13. 1. Mok TS et al., Gefitinib or carboplatin-paclitaxel in pulmonary adenocarcinoma. N Engl J Med. 361(10):947?957 (2009). 2. Rosell R. et al., Erlotinib versus standard chemotherapy as first-line treatment for European patients with advanced EGFR mutationpositive non-small-cell lung cancer (EURTAC): a multicentre, open-label, randomised phase 3 trial. Lancet Oncol. 13, 239–246 (2012). 3. Sequist L. V. et al., Phase III study of afatinib or cisplatin plus pemetrexed in patients with metastatic lung adenocarcinoma with EGFR mutations. J.Clin. Oncol. 31, 3327–3334 (2013). 4. Yu HA et al., Analysis of tumor specimens at the time of acquired resistance to EGFR-TKI therapy in 155 patients with EGFR-mutant lung cancers (2013) Clin. Cancer Res. 19, 2240–2247. 5. Maemondo M et al., Gefitinib or chemotherapy for non-small-cell lung cancer with mutated EGFR. N Engl J Med. 362(25):2380?2388 (2010). 6. Mitsudomi T et al., Gefitinib versus cisplatin plus docetaxel in patients with non-small-cell lung cancer harbouring mutations of the epidermal growth factor receptor (WJTOG3405): an open label, randomised phase 3 tria Lancet Oncol. 11(2):121?128 (2010). 7. Zhou C et al., Erlotinib versus chemotherapy as first-line treatment for patients with advanced EGFR mutation-positive non-small-cell lung cancer (OPTIMAL, CTONG-0802): a multicentre, open-label, randomised, phase 3 study Lancet Oncol. 12(8):735?742 (2011). 8. Janne PA et al., AZD9291 in EGFR inhibitor-resistant non-small-cell lung cancer. N Engl J Med 372:1689–1699 (2015). 9. Mok TS et al., Osimertinib in EGFR T790M-Positive Lung Cancer. New Engl J Med 18;376(20):1993-4 (2017). 10. Thress KS et al., Acquired EGFR C797S mutation mediates resistance to AZD9291 in non-small cell lung cancer harboring EGFR T790 M. Nat Med. 21(6): 560–562 (2015). 11. Yu HA et al., Acquired Resistance of EGFR-Mutant Lung Cancer to a T790M-Specific EGFR Inhibitor: Emergence of a Third Mutation (C797S) in the EGFR Tyrosine Kinase Domain. JAMA Oncol. 1:982–984 (2015). 12. Song HN et al., Acquired C797S Mutation upon Treatment with a T790M-Specific Third-Generation EGFR Inhibitor (HM61713) in Non-Small Cell Lung Cancer. J Thorac Oncol. pii: S1556?0864(15)00209?9 (2016). 14. Niederst et al., The allelic context of the C797S mutation acquired upon treatment with third generation EGFR inhibitors impacts sensitivity to subsequent treatment strategies. Clin. Cancer Res. 21, 3924–3933 (2015). Starting material: tumor tissue (fresh, frozen, FFPE), plasma. 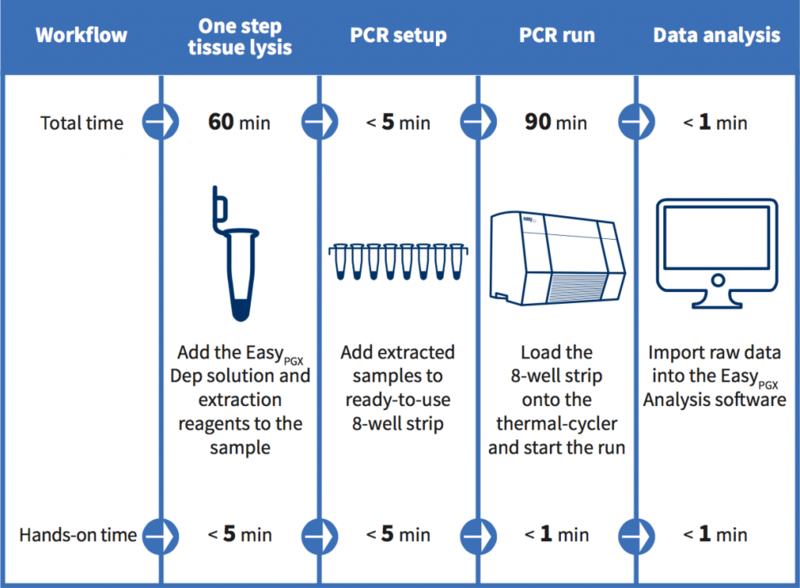 Operating principal: Real Time PCR is used to selectively amplify mutated DNA. 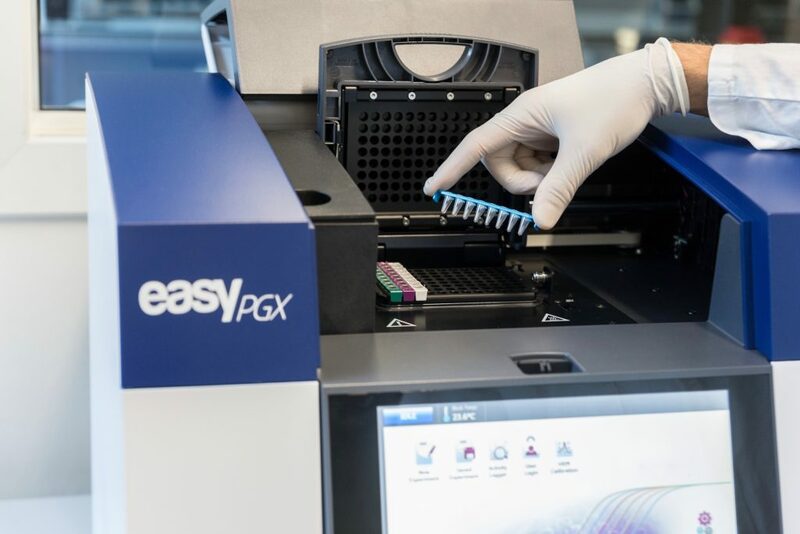 Ready to use: tissue extraction included, PCR reagents delivered in 8-well strips preloaded with a complete master mix in a dry, room temperature and stable format. Easy to use: no freezing and thawing, no need to pipette on ice and the few remaining pipetting steps minimize the risk of errors or contaminations.